Welcome to the Digi Scrap Parade for May 2017! I love this month's theme, and I chose to go with "Home is where our story begins." And that's why we scrapbook and tell stories! I'm so glad I stumbled upon this hobby 6 years ago and I got to share this journey with all of you. Simply click on the preview below to download my portion of the parade! You have come from ninigoesdigi. Your next stop is NBK Design. 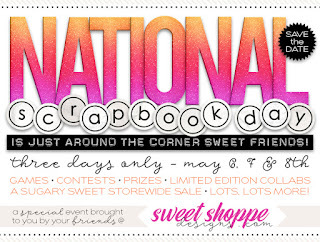 Speaking of scrapbooking, May 6 is (inter)national scrapbook day. This year I will have 3 brand new collections that'll be on sale. Here are some sneak peeks! I'm also the featured designer at SSD this weekend. It's going to be awesome and I have a free-with-purchase kit for you. Sign up for my newsletter here so you don't miss the amazing deals and fun this iNSD! Thank you, Grace, for your contribution to this month's parade. I love the theme, and I especially love your home/heart paper. It is cute and unique. thank you Grace! I'm loving this! Thank you!!! Lovely mini kit. Thank you for this delightful kit, so full of heart! Thank you! I love that polka dot flower! Thanks so much. Love those little houses.